Remembering the French resistance spy, diplomat, Buchenwald survivor and human rights defender. In September 2011, I introduced Stéphane Hessel at a conversation moderated by n +1 editor Nikil Saval at Columbia University. 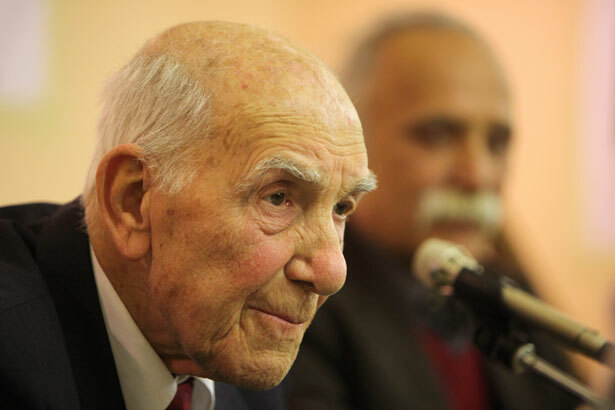 Hessel passed away last night at the age of 95. My remarks follow. It is a great honor to be here tonight with Stéphane Hessel, a voice of humanity and conscience in a time when such values are so dangerously imperiled. A distinguished French diplomat, leader of the resistance, survivor of Buchenwald and one of the drafters of the United Nations Universal Declaration of Human Rights. i would like to tell you that it was my wisdom as an editor that led me to this publishing coup. After all, “Indignez-vous!” had already, at the end of 2010, become a publishing and political phenomenon—rising to the top of France’s bestseller list and selling millions of copies across Europe. But the moral here is quite simple and universal. Listen to your father, especially when you have a father, as I do, who had the great fortune to be Stéphane Hessel’s colleague in Geneva, where Stéphane was the French ambassador to the United Nations, and my father, William vanden Heuvel, his US counterpart. And it was my father, the night in 1978 when I was released off a hijacked plane in Geneva, who introduced me to Stéphane. You see, Stéphane had been at my father’s side for hours, offering solace and friendship, while they they waited for my release. Meeting Stéphane that night, I knew there was goodness in this cruel world. So it was decades later that my father told me of what I think of as the Hessel phenomenon, of this slim yet magnificent pamphlet sweeping the globe, with its spirited call to nonviolent resistance. I swept into action—and spent weeks negotiating with Stéphane’s French publishers so that The Nation could be the first to publish “Indignez-vous!” in America. After all, Stéphane’s message is one woven into the historical fabric of The Nation, a magazine founded in 1865 by abolitionists committed to the moral cause of ending slavery, a magazine which has published the words of Martin Luther King Jr., Albert Einstein, Bertrand Russell, Hannah Arendt and Jean-Paul Sartre. Men and women who, like Stéphane, have argued and fought for a more just, more democratic and more peaceful world. Above all, Stéphane’s words capture these times, our times, ones of extraordinary peril—and possibility. A younger 93-year-old is not to be found. Stéphane forces us, especially the young, to ask how we can look at today’s world, its rapaciousness, its cruelty, and not be angry. Hessel calls on us all, those in his beloved France and those around the world, to engage actively in defense of human and economic rights. His fierce advocacy of nonviolent activism captured—and, in many cases inspired, powerful movements and protests—the uprisings in Tunisia & Egypt, in our own Wisconsin, on Wall Street. And anti-austerity demonstrators in Athens borrow their name from the Greek edition of “Indignez-vous!”; Spain’s indignados who occupied Madrid’s Puerta del Sol to protest record unemployment carried copies with them as they marched. I especially love that women marching in Italy to protest Silvio Berlusconi’s corruption displayed the book’s cover on street posters. He understood how important it was to convince despairing young people that they could change their society for the better. He believed that when people find their power, their passion and their anger, they can overcome entrenched and financially powerful interests. His voice rises above the din because he has seen and overcome far worse times. Arrested by the Gestapo and shipped of to Buchenwald, he swapped his identity with another French prisoner who had died of typhus and succeeded in escaping. As a citizen of what Gore Vidal used to call the “United States of Amnesia,” I am especially grateful to Stéphane for calling upon us to remember the best in our history and to defend its highest achievements. In our case, he gives strength to those who are fighting the forces in our country intent on repealing the New Deal, the Great Society, even the Enlightenment and reason.